After experiencing difficulties with production quality from multiple suppliers, we were selected as the single source contract manufacturer for a new and improved design even though our industry-leading customer had significant in-house robotic welding resources available. Working closely with their design team to understand critical characteristics, we implemented high volume production techniques that included progressive die-stamped and precision-formed components, multiple-stage weld fixtures to hold tight tolerances, and dual-arm robotic MIG welding to control weld distortion. This allowed us to produce an economic, precision weldment without post machining or the corrective operations which prior suppliers found necessary. 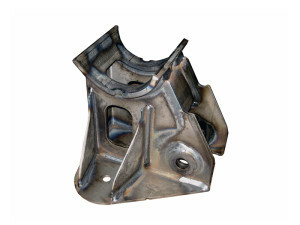 Product Description – Axle Seat assembly used in single and tandem Class-8 Semi trailer suspensions. 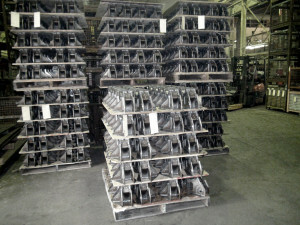 Materials – High Strength Low-Alloy (HSLA) steels – grade 50 & 80, in 1/8”, 1/4″, and 3/8” coil stock. Tightest Tolerances – +/- .005″ and perpendicularly to .020”, without machining. 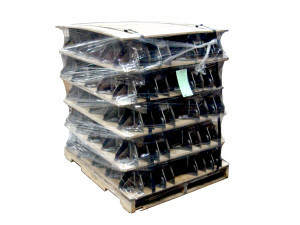 Quantities – Production lot sizes of 200 pc to 12,000 pcs. Inspection – Dimensional using Faro Arm CMM and part specific Go/NoGo Gauges, Welds to AWS D1.1 and numerous customer specs, AWS Certified inspection – Fillet gauge and visual ND, initial and periodic Macro-Etch.